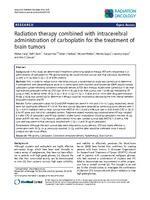 Background: In this study we determined if treatment combining radiation therapy (RT) with intracerebral (i.c.) administration of carboplatin to F98 glioma bearing rats could improve survival over that previously reported by us with a 15 Gy dose (5 Gy × 3) of 6 MV photons. Methods: First, in order to reduce tumor interstitial pressure, a biodistribution study was carried out to determine if pretreatment with dexamethasone alone or in combination with mannitol and furosemide (DMF) would increase carboplatin uptake following convection enhanced delivery (CED). Next, therapy studies were carried out in rats that had received carboplatin either by CED over 30 min (20 μg) or by Alzet pumps over 7 d (84 μg), followed by RT using a LINAC to deliver either 20 Gy (5 Gy × 4) or 15 Gy (7.5 Gy × 2) dose at 6 or 24 hrs after drug administration. Finally, a study was carried out to determine if efficacy could be improved by decreasing the time interval between drug administration and RT. Results: Tumor carboplatin values for D and DMF-treated rats were 9.4 ±4.4 and 12.4 ±3.2 μg/g, respectively, which were not significantly different (P = 0.14). The best survival data were obtained by combining pump delivery with 5 Gy × 4 of X-irradiation with a mean survival time (MST) of 107.7 d and a 43% cure rate vs. 83.6 d with CED vs. 30-35 d for RT alone and 24.6 d for untreated controls. Treatment-related mortality was observed when RT was initiated 6 h after CED of carboplatin and RT was started 7 d after tumor implantation. Dividing carboplatin into two 10 μg doses and RT into two 7.5 Gy fractions, administered 24 hrs later, yielded survival data (MST 82.1 d with a 25% cure rate) equivalent to that previously reported with 5 Gy × 3 and 20 μg of carboplatin. Conclusions: Although the best survival data were obtained by pump delivery, CED was highly effective in combination with 20 Gy, or as previously reported, 15 Gy, and the latter would be preferable since it would produce less late tissue effects.